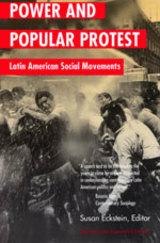 Eclectic and insightful, these essays—by historians, sociologists, political scientists, and anthropologists—represent a range of subjects on the cause and consequence of protest movements in Latin America, from an examination of the varying faces but common origins of rural guerilla movements, to a discussion of multiclass protests, to an essay on las madres de plaza de mayo. This volume is an indispensable text for anyone concerned with reducing inequities and injustices around the world, so that oppressed people need not be defiant before their concerns are addressed. A new preface and epilogue discuss recent social movements. Susan Eckstein is Professor of Sociology at Boston University.